With AI and data from your newest team member, retail work has never been easier. Bossa Nova, a leader in creating autonomous service robots for the global retail industry, tracks inventory plus store and shelf conditions in real-time. Its solution delivers data with speed and accuracy. By reducing inventory time, Bossa Nova is able to provide real-time data for stock levels with improved accuracy. So how does this translate to a financial gain for retailers? First, by automating mundane tasks, employees are happy and happy employees make a happier retail environment. You might wonder how many hours are spent on mundane tasks such as inventory audits. There are 30,098 items in the average grocery store. A typical Target store has around 80,000 SKUs and a Walmart Supercenter sells up to 120,000 items. It takes about 20 human hours to audit 10,000 products. Following this logic, an average grocery store would require over 60 hours per store, 160 hours per store for Target, and a whopping 240 hours auditing shelves at a Walmart Supercenter. It’s easy to see how grocery stores following the recommended minimum quarterly inventory schedule forfeit a high proportion of human working hours to this task. For those that audit monthly, the labor costs are even more tremendous. Bossa Nova helps retailers automate these inventory audits and monitor shelf-conditions in parallel, scanning an 80 linear foot aisle in 90 seconds with 98% accuracy. 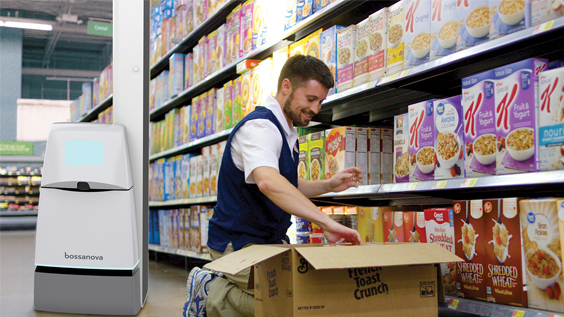 Through automation, employee focus can be shifted to more action oriented, customer-centric tasks, while the Bossa Nova robot detects anomalies in shelf conditions, covering everything from addressing out of stock and misplaced items, to pricing, and more. This shift in employee focus to the customer directly translates to higher shopper satisfaction and increased loyalty. It is estimated that out of stocks cost retailers over $129 billion in lost sales in North America - a loss of -4% of revenue annually. (the cumulative worldwide cost of out-of-stocks for retailers has now reached over $984b). A study conducted by MIT Supply Chain Management Research determined that 78% of products that are not on the shelves (i.e. out of stocks) are actually on-hand. Given this, a majority of out-of-stock issues can likely be resolved in-store. Inventory replenishment is critical to success, and those tasks need to occur at store level. Having the right products in the right place when consumers are looking for them (both online and in-store) allows sales to escalate and deliver a sales velocity that makes the most effective use of each square foot of space. Bossa Nova is committed to maximizing this efficiency by gathering reliable, real-time data that delivers task oriented, actionable items. Efficient inventory control improves speed-to-shelf by alerting store-level associates of inventory on hand, as well as buying desks / suppliers of true OOS situations. Through computer vision implementation, retailers can accurately assess, and more importantly, address in-store conditions in real-time, across all locations. Real-time accuracy is not only important to retailers, but it is also important to your shoppers. By having accurate inventory, confidence thresholds for item availability can be increased for both in-store and online shopper inventory inquiries. In fact, 81% of shoppers do research online before visiting a physical store for what they want to buy, yet only 27% of retail sites provide store level inventory. Bossa Nova has the credibility and experience to help retail operations realize the return on investment and successfully integrate with existing platforms and systems. When the robot “wheels” into your stores, you will be saving intensive labor hours and improving your store conditions with unmatched accuracy. There are two popular sayings that really affect your bottom line: “Timing is everything”, and “Time is money”, and in business, money really is everything. While many technology companies are still working to surmount the bell learning curve of applied technology, Bossa Nova is equipped with extensive retail experience and has been trusted by operations and IT professions to successfully integrate and lead this huge step in retail automation. With accurate inventory management, you can increase your revenue potential and more accurately can forecast the future.